Since the beginning of Russian aggression Ukraine, consistently ranking in the top ten exporters of weapons in the world, driven by the necessity to completely re-equip its own army, is replacing the weapons inherited from Soviet times. GordonUA has chosen several new products of the Ukrainian defense industry which are already deployed to the front or which may be deployed in the future. 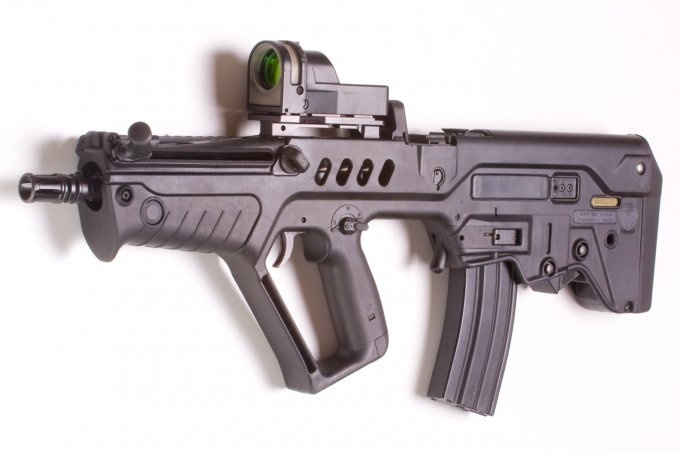 Development of the Israeli TAR-21 is produced under license in Vinnytsia at RPC Fort. The rifle uses a “bullpup” configuration, in which the bolt carrier group is placed behind the pistol grip; this shortens the overall length but does not sacrifice barrel length. As a result, the TAR-21 provides carbine length, yet achieves rifle muzzle velocities. The housing is made of impact-resistant plastic reinforced metal which helped to significantly reduce the weight. Formally, the production of the “Fort-221” under Israeli license began in Ukraine in 2009, but until recently these assault rifles and a shortened variant, the “Fort-224,” were only purchase in small quantities for Special Forces of the SBU (Ukrainian Security Service). It is known that, after the beginning of the conflict in Donbas that the “Fort-221” appeared among the weapons used by the “Tornado” battalion of the MVD (Ministry of Internal Affairs). The Defense Ministry reported on its intention to purchase about 500 of these weapons. Effective range 550 m, 5.56 mm caliber, 750-900 rounds per minute, mass with magazine is 4.3 kg. This modified version of the “Zbroyar” Z-008 Ukrainian sport/hunting rifle is made in Kyiv at the “Mayak” production factory. It can be operated with either single cartridge or with a 5-10 round magazine. Compared with the heavier, traditional Ukrainian rifle SVD which the army inherited from Soviet times, this weapon is only 4.5 kg versus 5-7 kg for the SVD, but has a greater sighting range of 900 m versus 800 m). The first samples were presented in 2012 and the company commenced mass production in spring of 2014. The first lot entered service with the National Guard in July. Effective range is 900 m, 7.62 mm x 51 mm caliber, 15 rounds/min, mass with magazine of 5-7 kg. Developed in Kyiv: the first prototypes were produced at the plant, “Lenіnska kuznya,” in 2010. The first Ukrainian portable automatic belt-fed grenade launcher. Fully compliant with NATO standards but, in contrast to Western models, is much easier to use. It is supplied with a tripod mounting structure which allows for rapid weapon deployment. High level of portability and easy preparation of operating site allows for quick change of firing position both in the open air and in an urban environment. 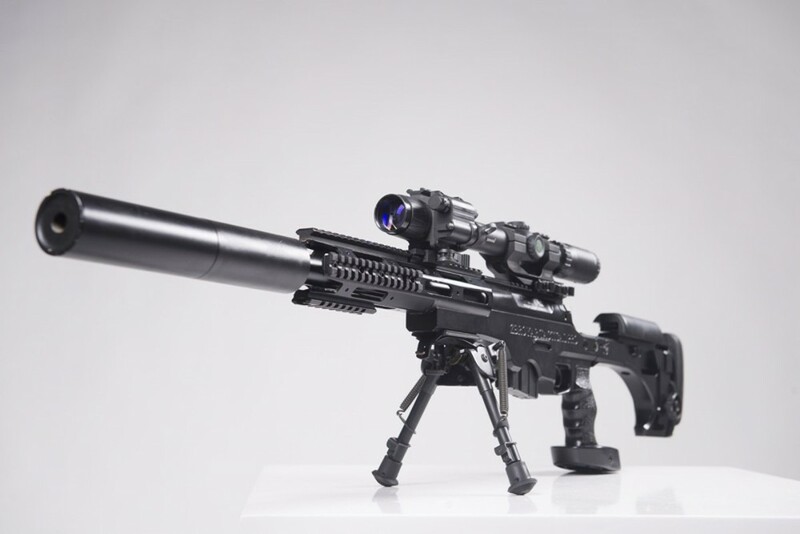 The Ministry of Defense was interested in domestic development and conducted tests of the grenade launcher, however there is no current information on deliveries of this model to the Ukrainian Armed Forces. The Stugna-P is an anti-tank missile system designed and manufactured in Ukraine. Stugna-P has been developed by Kiev-based, Luch, design bureau to compete with foreign models of the same class. Round comprising “STUGNA” antitank guided missile is intended for firing from the tank T-55 or antitank artillery gun MT-12 against stationary and moving modern armored objects with combined, incomplete or monolithic armor including ERA (explosive reactive armor), and also against pinpoint targets like weapon emplacements, tank in a trench, lightly armored objects. The Stugna-P is also capable of destroying low-altitude, slow-moving aerial targets. The laser-guided system has a range of 5 km and can penetrate armor up to 800 millimeters thickness. The operating temperature range is from – 40° to +60°C. In October 2010, the Ministry of Defense of Ukraine ordered from GKKB “Luch” ten systems “Stugna-P” for testing. In February 2015, the mobile version of the “Stugna-P” was presented, mounted on the chassis of a light vehicle. In March 20, 2015, mass production of anti-tank systems “Stugna-P” was begun. Bars was developed in 2014 at the Design Bureau of the Cherkassy automobile factory and demonstrated in December 2014 at the National Guard site near Kyiv. This vehicle is capable of carrying 4-6 people in full uniform in addition to a two-man crew. The housing consists of steel plates welded together at angles such that the vehicle provides protection against 5.45 mm and 7.62 mm munitions. The four-wheel drive vehicle is powered by an Isuzu engine. The Ukrainian National Guard announced their intention to purchase 90 “Bars.” In addition, this vehicle will participate in the Ministry of Defense tender for the purchase of light-armored vehicles. Highway speed of 100 km/hr and a range of 600 km. This vehicle was developed by the Canadian company, Streit Group, at their manufacturing facility in Ontario, Canada. It is based on a Toyota Landcruiser chassis and is currently being manufactured in Ukraine at the Kremenchuk Automobile Plant (KrAZ) in Kremenchuk, Ukraine. The Cougar is a multi-functional Light Armored Vehicle with cross-dimensional characteristics which allow it to be used in a wide variety of applications including military, police and tactical. It has been designed to withstand ballistic assaults as well as to protect the occupants against mines and grenade blasts because of the reinforced under-carriage. In early August 2014, Ukraine’s Ministry of the Interior ordered 21 of these vehicles for the National Guard. The Kuguar has a shielded weapon mount on the roof. It can be armed with 7.62-mm, 12.7-mm machine guns or 40-mm automatic grenade launcher. Vehicle accommodates up to 9 troops, including the driver. Troops enter and leave the vehicle via side or rear doors. There are some observation windows and firing ports provided for the troops. Alternatively it can carry up to a 1 000 kg of supplies. The Kuguar is powered by either a 4-liter Toyota turbocharged diesel engine, developing 240 hp, or 4.5-liter petrol engine, developing 218 hp. There is also a Toyota 4-liter petrol engine, developing 228 hp. Engine is mated to a 5-speed manual transmission. Vehicle has a 4×4 configuration with full-time all-wheel drive capability. The brain-child of Ukainian designers at the Kharkiv Morozov Machine Building Design Bureau is the BTR-4M, which was first demonstrated at the weapons exhibition IDEX-2013 in the UAE. The vehicle has a conventional layout similar to western designs like the German TPz Fuchs in which the driver’s and commander’s compartment are at the front part of the hull, the engine and transmission compartment in the middle, and the troop compartment at the rear. Personnel enter and leave the vehicle either through the rear doors or the roof hatches, and the driver and the commander are provided with doors located on the sides of the hull. The BTR-4 has a maximum speed of 110 km/h and can cross water obstacles at a speed of 10 km/h. The vehicle is powered by a 3TD diesel engine with 500 hp. It was reported to being hit by several rpg rounds and multiple small-arms fire with no consequences. Slat armor can be fitted for maximum protection against RPG attacks. Several dozen BTR-4 are already in service with the National Guard. These vehicles have also been sold to Iraq, Kazakhstan and Nigeria. On 4 June 2014, company officials revealed that the BTR-4E was being used in military operations in the Slavyansk area. Its armor had withstood hits from large-caliber machine guns, counter-HEAT side screens protected the crew from anti-tank grenade launchers, and armored glass sustained direct hits from sniper rifles. The Oplot-M is another development of the Kharkiv engineers and produced at their plant. This tank is based on the T-84 main battle tank and is armed with 125 mm smooth-bore cannons, coaxial machine guns and a KT-12.7 anti-aircraft gun. The main gun can also fire laser-guided missiles against battle tanks, armored vehicles and helicopters. It is equipped with an automatic fire control system, thermal imaging sights, including three forward-facing periscopes in front of the driver’s dome. The center periscope can be replaced with a night-vision scope. The protection system can include multi-layer passive armor, Nozh-2 explosive reactive armor, and the Zaslon active protection system. The tank can also be equipped with Varta optronic countermeasures. The Nozh-2 system protects against anti-tank grenades, stationary grenade launchers and recoilless guns, TOW-2, MILAN and Shturm-S anti-tank missiles, HEAT projectiles, and APFSDS projectiles fired by 125 mm tank guns. The Oplot M is powered by a 6TD-2E 6 cylinder turbocharged liquid-cooled engine, which delivers 1200 hp. The tank has a maximum speed of 70 km/hr and a range of up to 500 km with additional fuel tanks.